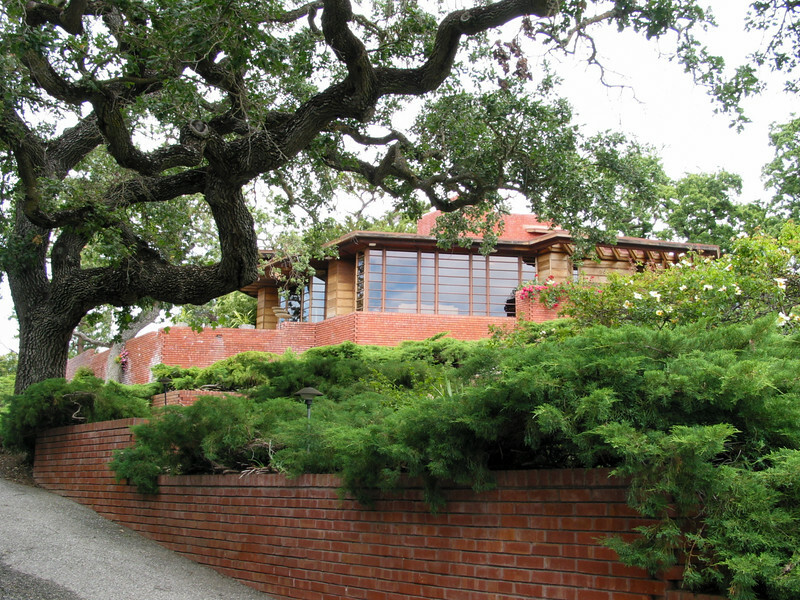 The Hanna House was designed by Frank Lloyd Wright in 1936, for Stanford Professor Paul Hanna and his wife Jean. They lived there with their three children, added the Workshop in 1950, and in 1957 had the house modified following Wright's plans after the three children left. In 1975 they gave the house to Stanford, and it became the Provost's residence. The house was badly damaged in the 1989 Loma Prieta earthquake, but has now been almost completely restored, re-opening in 1999. This was Wright's first building in the San Francisco area, and his first design on a hexagonal grid, hence the house's nickname of the Honeycomb House. It is constructed of redwood boards and San Jose brick, on a concrete slab floor. The site is a beautiful hillside on the Stanford campus, with magnificent old live oaks around which the house is carefully placed.